On behalf of the staff and former Sr. Warden’s we wish to thank you for your faithful commitment to engage the discernment process this fall. While the question before our congregation was a serious and sobering one, the depth and richness of the materials and sermons combined with your participation in LifeGroups has worked to deepen our corporate understanding of the Lord’s direction in our life and the call upon this parish, so, thank you. 902 total discernment response forms submitted. 838 recommended that St. Andrew’s Church affiliate with the Anglican Church in North America and separate from The Episcopal Church. 58 recommended that we remain within The Episcopal Church. 4 response forms were submitted unmarked. 2 response forms had the word, “abstain” written across them. We were very pleased with the total number of people participating in this discernment process and we were equally pleased with the clarity with which you – and the Lord through you – spoke to us. We will gather as a Vestry in the New Year to take up this matter. Be assured we will keep you informed of our decisions. Please keep us in your prayers. Know that this letter comes with our continued prayers for this parish and for you; especially that you may know the nearness of Christ this Advent and Christmas season. Read it all here. St. Andrew's Mt. Pleasant is currently the largest parish in the Episcopal Diocese of South Carolina. It is a lovely church. I have worshipped there. I very much respect the conviction which would lead so many to leave it behind and forge out on their own. I don't believe they are leaving it behind, Scout. I think that was the point of the vote. How can one vote to leave a church, but keep the property? I should have tried that with the cool apartment I had in California when I was a young lawyer out there. It never occurred to me. The place is worth a fortune now. But I would have thought property rights can't be created or determined by taking a vote. Otherwise, any "vote" on a property question would always be won by people who coveted the property. Can you imagine actually putting to a vote in a church schism context, whether the departees should keep the property? Given human nature, of course they're going to say yes. This is when a strong diocesan Bishop needs to put his foot down, preferably before the departure, so that there are no illusions. Bishop Lawrence seems like a fairly no-nonsense type. I don't see how he could put up with this, especially in a parish of such prominence in his diocese. Can't activate the link, but I am familiar with the case. I don't think the last word (legally) has been heard on these issues in South Carolina and one would assume the Diocese would feel obligated, as a matter of stewardship, to contest the Pawley's Island disposition. 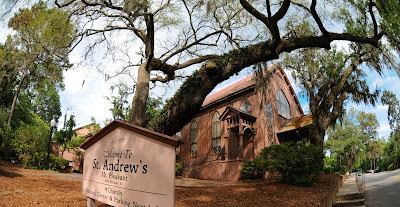 Changing the subject a bit, can we safely assume that those at St. Andrew's who voted to stay will continue to worship there with Episcopal clergy? That's like saying that the those who voted for John McCain get to keep him as president anyway. Last time I checked we still thought that votes matter, at least in the United States. I've had the honor of voting for John McCain several times (not in the same election), but I don't think that's anything like the matter at hand. Votes count when we elect officials and representatives in a democratic republic. Frankly (sorry to be blunt about this) votes don't matter at all in ascertaining legal title to property, not in the United States, and not in a lot of other places either. I would hate to see that system get a foothold in this country, not in secular property disputes and most certainly not in religious or church matters. (It reminds me of the old leftist slogan "All Power to the People" that was all the rage on campus in the 1960s. We'll just pack a hall and then we own the university). I hope the import of that last comment is not that the good people who did not vote to leave are just SOL and cast out as far as Episcopal worship at St. Andrew's (It would be horrible at any time, but especially right before Christmas). I would think the Diocesan officials would be really steamed if that were the case. No one with even vaguely Christian sensibilities would find that situation tolerable. The votes of the people do still matter, at least they do at this writing in Virginia. In the case of my own parish, we have chosen to stay together as a community come what may. The Church is the people and the buildings belong to the Lord, it is held in trust by the trustees we elected. It is held in trust. And so are we. You could have left without a vote and stayed together as a community without claiming the property. That would have been impressive witness, indeed. If the buildings belong to the Lord, by what right do some of His people get to tell others to bugger off? Does property transfer based on correct theology (as determined by those who espouse that particular theological position)? Not the best system, in my view. Tonight at the Cafe: Is Anybody There? And Jesus fits in - where?